The city is far from "on its knees" Steve, take a look at page 5 of the very same newspaper today that your bit was in and it straight up defies your glittering generality take on this, right there in black and white. A terminal in the Broadwater would be an arrow through the heart of our domestic tourism appeal, certainly not a wise economic choice at all. Extending the rock walls of the seaway and dredging the entrance will have a drastic effect on the surf break at Straddie - Your suggestion that the break might just "manifest further up the beach" is pure speculation, and even with the limited data and understanding that we have presently, would seem very, very unlikely at this stage. Answer me this Steve if you please - how would carving out the seaway, dredging, construction and operation of a terminal, rendering the local surfing, recreation, fishing, diving and water activities there virtually null and void and losing this city tens and tens of millions of dollars per year for our economy that currently come in at almost zero cost to the city, how on earth could this be helping us in terms of "economic growth"? How can 'canned' tourism operations, cruise ship passengers that like to 'save' their money and have already paid for all meals on board help us up from our "knees"? Are they even going to come, the cruise ship companies are notorious for up and leaving towns and cities high and dry with almost no notice, they can and do do this. Do you really think that with a terminal you'll be able to just up and paddle over to the same perfect break at TOS and everything will be peachy? The entire region in the seaway would become a silted nightmare because of the dredges, with as many restrictions as an international airport, fences galore, razor wire and customs and quarantine, total lock down of the area any time a ship is near - the area's vast array of established benefits for this city would be forfeited forever and a very significant portion of our visitors and locals impacted permanently and heavily by it. 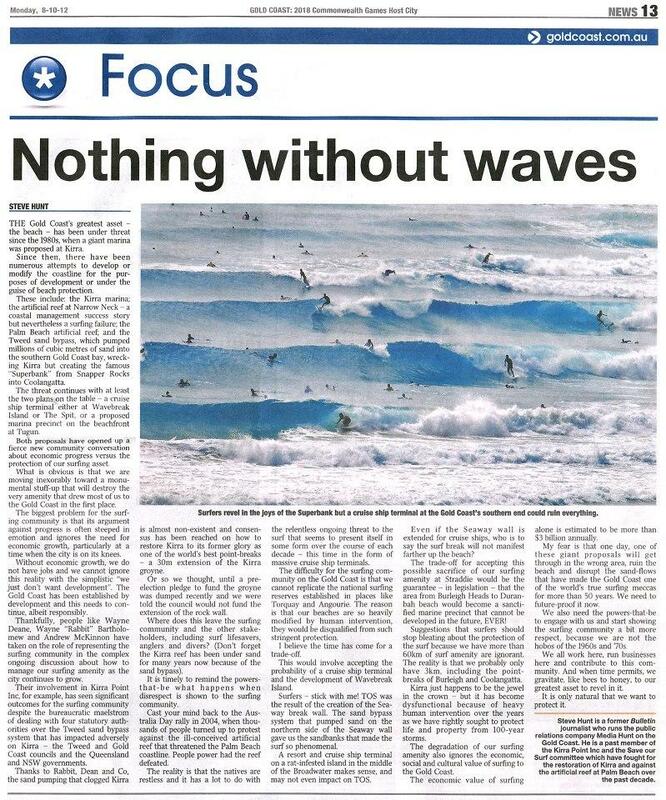 With all due respect to your past work with protecting our surf breaks from bad decision makers and your demonstrated passion for our surfing community, it's rather awful to hear you gloss over the issue here and basically suggest that we should accept the terminal at the north end of the coast, and that your end of the coast could even benefit from it. Surfers beware this kind of divisive talk, it's exactly why the terminal proposal for Kirra was even touted by the Mayor, he won't be doing it at Billinga/Kirra, he has clearly stated that it is not his interest and not what he supports. It was pushed to deceive and trick you all into thinking you have to choose one or the other when in reality the choice is and always has been neither! I can honestly say that every north end surfer would fight any battle to protect the southern breaks and have done time and time again alongside, and as part of a unified surfing community on the Gold Coast. I've fought and thrown my weight in over the years, as much as I could even as a child, to stop the bridge to North Straddie, to stop the marina proposal to Kirra, to stop the Palmy reef, to keep our beaches clean, surf breaks working, protected and belonging to us all - it's sad to see Steve, that you're seemingly willing to sacrifice a whole lot up here, not just a surf break but the real and absolute Gold Coast marine park, and that you have used the issue in an attempt to divide people by way of your wild and unfounded claim that it could actually benefit the southern surf break areas. We're still here to fight for the protection and restoration of Kirra, and will continue to do so, we would NEVER use that topic as leverage or a "trade off" to fight against a terminal in the Broadwater as you seem to have done in reverse in this case. Our stance is clearly no terminal for the north end, no terminal for the south end and yes we support the ENTIRE Gold Coast surfing community on all fronts and for all causes (because that's a big part of who we are made of, and that's the people that matter to us!) We would NEVER trade one section for another.